Acinetobacter baumannii can cause severeinfections, mainly in critically ill inpatients. Treatment iscomplicated by multidrug-resistance (MDR). In Germany, todate, little is known on the extent of MDR in A. baumanniiisolated from inpatients in German hospitals and potentialfactors influencing the emergence of MDR. We retrospectively analysed thedata of A. baumannii isolates from the inpatients of fourGerman university hospitals, tested for antimicrobial resistancewith the broth dilution method between 2002 and2006. We defined MDR as resistance to three or more classesof recommended drugs. After calculating the proportions ofMDR in A. baumannii isolates, we investigated the associationbetween MDR in A. baumannii and year of pathogenisolation, hospital, ward type, specimen and demographics.We performed descriptive analysis and multivariable logisticregression. Additionally, proportions of in vitro drug effectivenessagainst multidrug-resistant and non-multidrugresistantA. baumannii isolates were determined. MDR was found in 66 of 1,190 (5.6%)A. baumannii isolates and increased from 2.1% in 2002 to7.9% in 2006. The highest proportions of MDR were foundin hospital A (8.9%), in intensive care units (7.3%), inisolates from blood (7.6%) and in male patients aged60 years or older (6.6%). 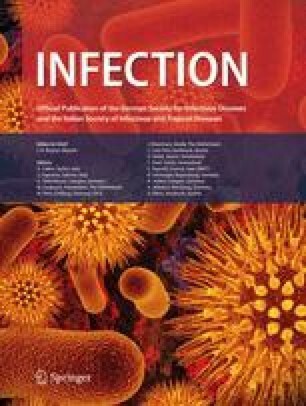 In multivariable analysis, thechance of MDR in A. baumannii isolates increased with thesuccessive years of pathogen isolation (odds ratio [OR] 1.3,95% confidence interval [CI] 1.1–1.5) and there was ahigher risk of MDR in A. baumannii in intensive care units(OR 1.8, 95% CI 1.1–2.9). The lowest in vitro antibioticresistance was found in meropenem, imipenem and ampicillin/sulbactam, with 33, 37 and 39% for multidrugresistantand 0.4, 1 and 3% in non-multidrug-resistantA. baumannii isolates, respectively. The increase of MDR in A. baumannii isolatesfrom 2002 to 2006 in four hospitals suggests that cliniciansin Germany may expect a rising proportion of MDR inA. baumannii isolates among inpatients. The antimicrobialsusceptibility testing of A. baumannii isolates against recommendeddrugs, combined with in-house antimicrobial resistancesurveillance, is needed to ensure appropriate treatment. Anonymous: Act on the Reform of the Communicable Diseases Law (Communicable Diseases Law Reform Act). 2000. Available online at: http://www.rki.de/cln_151/nn_209238/EN/Content/Prevention/Inf__Dis__Surveillance/inf__dis__down,template Id=raw,property=publicationFile.pdf/inf_dis_down.pdf.